Here’s a plant I consider a knockout, in my mind the most elegant and attractive daisy-like flower available in the nursery business. I also enjoy it because it has no common name, at least not here in the Twin Cities, so to find it you need to be able to remember and pronounce the Latin, Osteospermum. It’s native to South Africa, a perennial grown as an annual here in the north. I see it more and more every year in nurseries, and it’s not tough to grow from seed. It’s an extremely vigorous plant, reaching around eighteen to twenty inches in height and bushing out quite boldly during the growing season, similar to a mum. Pictured are actually three different colors-Orange, Lime, and Cream, and though the Web doesn’t do the photo justice, you get an idea of how muted are the colors. They are soft but have a distinctive glow about them, a dull shine, if that makes sense. The underside of the petal is slightly darker than the top, which is a very cool look, especially when ruffled by the wind. 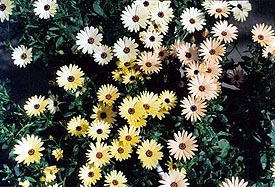 Osteospermum is a greedy plant; it needs lots of sun, lots of water, and lots of fertilizer to do well in our shorter, cooler season. It’s used to South Africa, remember. The plants I grow in my yard’s sunniest spot receive just over four hours of direct, midday sun, but frankly it’s not enough; the plants get lanky and need staking. Six hours or more would be much better. Space one foot to fourteen inches apart in good garden soil near the front to middle of the bed. They bloom profusely all summer long if grown in a soil that is not allowed to dry out, are fertilized throughout the season, and deadheaded regularly. Think about using them in containers. This spring I even saw them in hanging baskets at a few nurseries.